Last week was the first I’ve missed since I joined this challenge, and that is because I don’t really have any sunset shots, nor was I able to get any during the week. For this challenge however, I have one that I think fits the bill. I used it some weeks ago on my gratitude blog (see here) but it fits this challenge quite nicely. Take a look and tell me what you think. 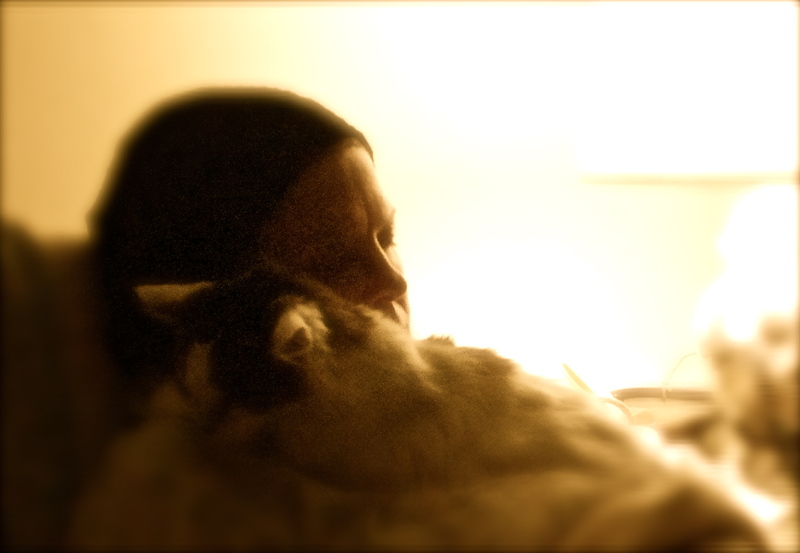 My cat, Pele, and I in a sweet moment. Pets have been a part of my life from day one. Growing up we had dogs. Brownie is the first dog I remember. 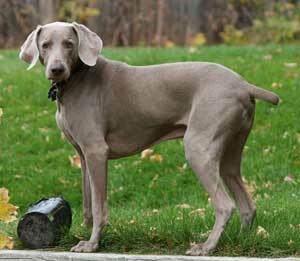 We lived in Greenwood, Louisiana, and Brownie, a Weimaraner, took up with my brother, Steve. Brownie was not the friendliest dog in the world, but he and Steve were inseparable. I don’t remember much about Brownie except that at times I was afraid of him. My favorite dog was Frisky, a combination cocker spaniel and hound dog. Frisky was beautiful, loving, and full of life and vitality. Not only did she go camping with us, but at night she took turns sleeping with us kids, going from sleeping bag to sleeping bag, burrowing down into the bag and snuggling close. Frisky also loved playing in the river when we camped, shooting the rapids on an air mattress with whoever would let her hitch a ride, flying past those on the shore with long ears flapping and loose tongue flopping as rider and passenger dog flew over the roiling waters. When past the swiftly running rapids, off she would jump, wade to the shore, and run at breakneck speed back to the head of the rapids to do it all over again. We also had cats: Midnight and Creampuff. Midnight, a solid black long-haired cat, was Dad’s cat. He really wasn’t much into us kids. Creampuff on the other hand, a golden-cream color tabby was mine. Cats weren’t as much fun for kids as dogs, but they were great for curling up in your lap and purring contentedly. There was something very comforting about the cats. As an adult, I have chosen to keep cats. Why? Ease of care. All a cat needs is food, water, and a litter box. 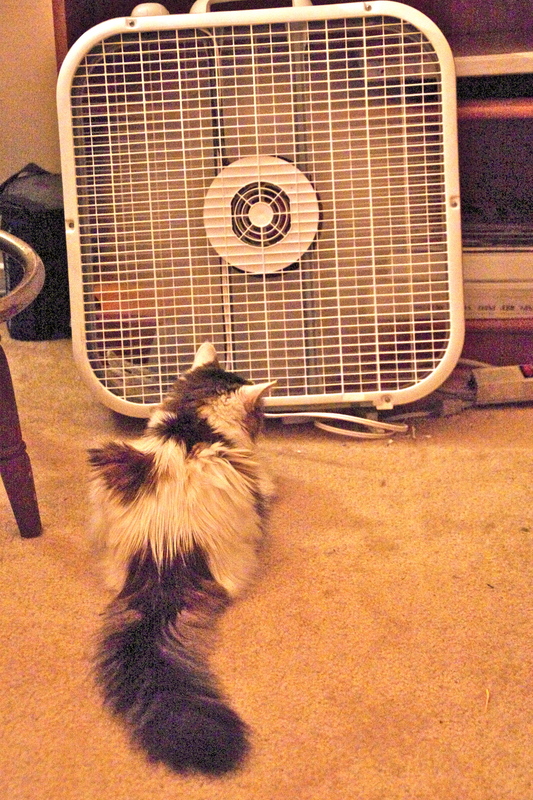 We can leave for days and only need someone to check on the cat(s) now and then. No walking. No boarding. Little hassle. Two cats in particular stand out as my all-time favorite pets. 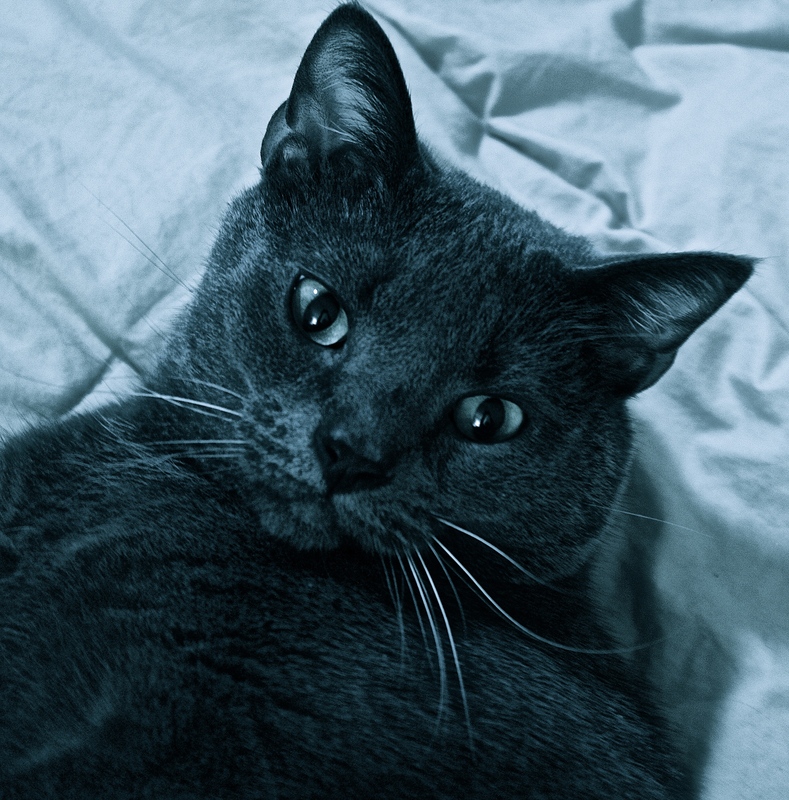 Possum was a Blue Russian Burmese cat. He was the smartest cat I ever saw, and cantankerous, persnickety, annoying, loud, bossy. . .and loved beyond reason or logic or understanding. The kids sometimes called him “Walter,” a label assigned to him by one of the girls’ old boyfriends. “Walter” fit; he looked professorial (you had to see him to understand). He was just Possum to me. I grieved a full year for that cat when he finally died at the ripe old age (for a cat) of 18 years. 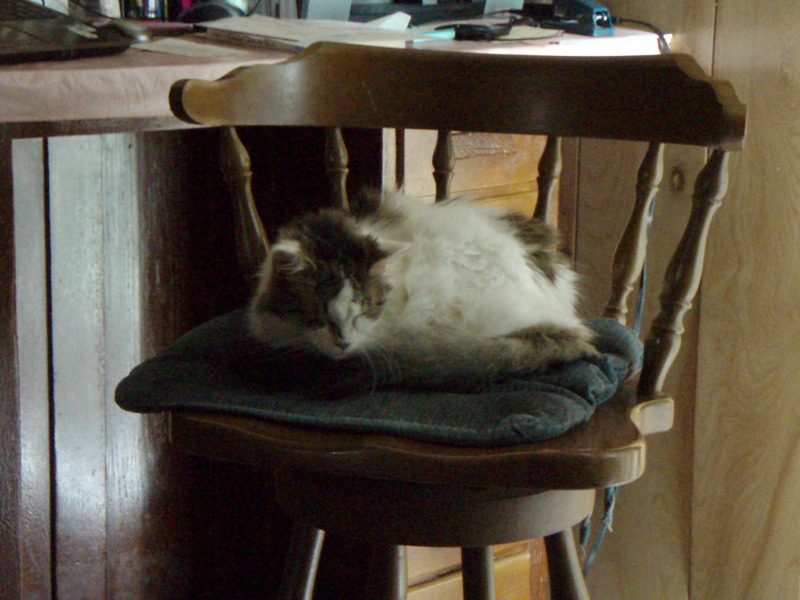 The other cat, Pele, has now been with me for seventeen years. She came into my life at 8 weeks old and has been a companion every since. Pele is a Norwegian Forest cat, a beautiful long-haired white with tabby patches. Unlike Possum, she is prissy, friendly, cuddly, petite . . . a “girly” cat with “beauty queen” good looks. Pele is definitely showing her age, though. This past weekend she had sudden onset blindness! Totally unexpected, but after talking to my daughter, the Vet Tech, I learned that this is not uncommon in old cats. Probably high blood pressure, and the retina most probably completely detached. Pele has also developed facial “tics,” more like slight shudders. For the first time I began to contemplate how much longer we would have Pele with us. For now we are showering her with loving care. Pele’s decline has evoked wistful remembrances, along with deeper reflections about the role of animals in our lives. Recently I received a copy of Yes! Magazine; the theme for this quarter is “Can Animals Save Us?” [I highly recommend this publication. It comes out quarterly (http://www.yesmagazine.org) and is full of “powerful ideas and practical actions.”] Filled with stories about the awesome world of animals, as well as controversies regarding animals as food, I found the section titled “We Second That Emotion,” particularly interesting. Story after story is told of the fascinating world scientists are discovering of the complexity of animal life, including their capacity to express emotions, communicate over many miles, use reason to create tools and to modify those tools when necessary! Most of us have read stories of how animals have come to the rescue, of each other and of humans, in times of need. 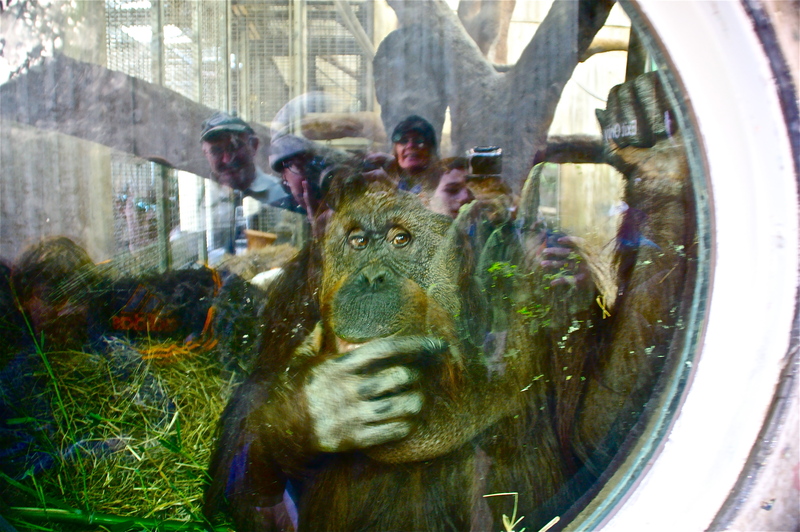 A few years back the news channels played a video many times over of a three-year old child who fell into the Gorilla Display at a zoo (Chicago, IL, http://www.metacafe.com/watch/429398/gorilla_saving_a_kid/ ). The onlookers were panicked expecting the worst for the child, but a huge gorilla came over to the child, gently lifted the child up and carried him to the door used by zoo keepers to enter the area to tend to the animals. The gorilla then backed away and the keeper entered to retrieve the child. All ended well and people were in awe of the behavior of this massive animal who could have crushed the child. Not to be naïve, one can find many stories of how animals have mauled or otherwise threatened humans, too. We do it to them and they to us. But the capacity for compassion, playfulness, industry, artistry (see one of the videos I’ve posted below), and more, exists in the animal kingdom to an amazing degree. Jewish law (halacha) instructs us how to treat animals. We must not cause them unnecessary distress or pain. (http://www.jewishveg.com/DShalachamussar.html for laws and mussar/instruction regarding animal treatment). Every morning when I arise, after my morning blessings, I feed the cat before I prepare my own breakfast. This is halacha/law. “Love of all creatures is also love of God, for whoever loves the One, loves all the works that He has made. When one loves God, it is impossible not to love His creatures. [The converse is also true.] If one hates the creatures, it is impossible to love God Who created them (Maharal of Prague,Nesivos Olam, Ahavas HaRe’i, 1)” (see link above). to be traits that were peculiar to humans. Having lived with animals all my life, I’m not surprised. I am sad to see Pele’s (my cat) decline, yet as I watch her adapt to her condition, I learn from her. Rather than curl up and retreat from the world, Richard and I watch her methodically go from room to room feeling her way around. She gets to where she needs to go without our help even though she occasionally walks into a door jamb or a chair. She lies beside me as I write, grooming as if nothing has changed. She adapts to what has been dealt. The late Viktor Frankl (1905-1997), in his book Man’s Search for Meaning, posits that our ultimate choice in life is the choice of how we will live in the face of what life presents: “The one thing you can’t take away from me is the way I choose to respond to what you do to me. The last of one’s freedoms is to choose ones attitude in any given circumstance.” Pele teaches me to take adversity in stride, to live in the present moment, to adapt to what life hands me. I thought you might like the urls below. They are links to a few sites that show amazing animals performing amazing feats, amazing to us humans only because we thought animals were not capable of such behavior and emotions. We are all G-d’s creation. It only makes sense that we are far more connected than we thought. Pensive Pondering of a Pedantic Soul. . .
Who is really on display? 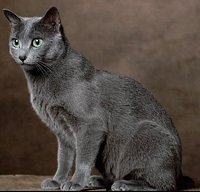 Photos of brown Weimaraner, and the Russian Blue cat were retrieved from the internet stock photography. I didn’t have any photos of either handy so I googled the terms to get pictures resembling my pets. The photos of Pele and the pensive pondering gorilla are mine.